Semi automatic, after loading by hand, the bottle is tested automatically. Full Automatic, loads & tests up to 1 SET of bottles automatically. 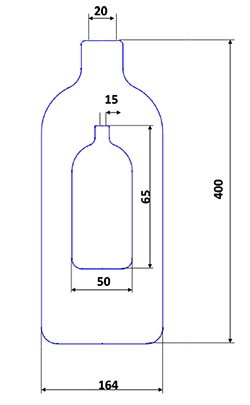 After the bottle/jar is loaded the interlocked safety door is closed and the test profile is selected from the HMI, (Test Profile:- initial pendulum position, bottle deg. rotation after impact, increase in pendulum drop height, height of impact etc.). After selecting START the test will proceed according the the sequence detailed in Test Profile until the bottle/jar destructs, which is detected by vacuum. The last pendulum drop height is recorded along with height & rotation. If you have difficulty accessing Youtube, please click here for an alternative source of videos.